The great grape of the Ports and robust table wines of the Douro is the Touriga Nacional, though Managing Director and co-owner of Quinta da Romaneira, Christian Seely, doesn’t think Touriga Nacional needs to make ‘big’ wines necessarily, but can produce something finer. That is true particularly for the table wines of his Quinta do Noval estate, and of the nearby estate called Quinta de Romaneira. 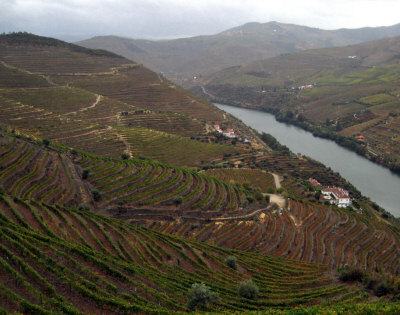 Both quintas share the Noval winemaking facilities in the Douro, and the common link is Seely. He is one of a group of private investors who purchased the large, beautifully sited but somewhat forlorn Romaneira vineyard in 2004. Since then, Romaneira’s vineyards have been substantially improved, terraces rebuilt and vines replanted where necessary. The ensuing range of vintage Ports and table wines has improved in quality dramatically. Part of the grand plan for this majestic estate whose terraces climb to dizzying heights above the river was to construct a super-luxury hotel and spa, which opened for business in 2008. Right: the hotel from the top of the Romaneira vineyard slopes.